The order sheet is both what you and the customer receive after the customer has completed their order. The format you choose will be the same if you choose to receive orders by email, fax, or printer. You can also create a custom message that the customer receives with their order. Please note these formats do not apply to orders received through the order monitor software. In your Online Ordering Console, you can change your order sheet layout by selecting "Restaurant Manager" from the main menu, and then selecting "Order Sheet Layout" under the "MORE SETTINGS" heading. 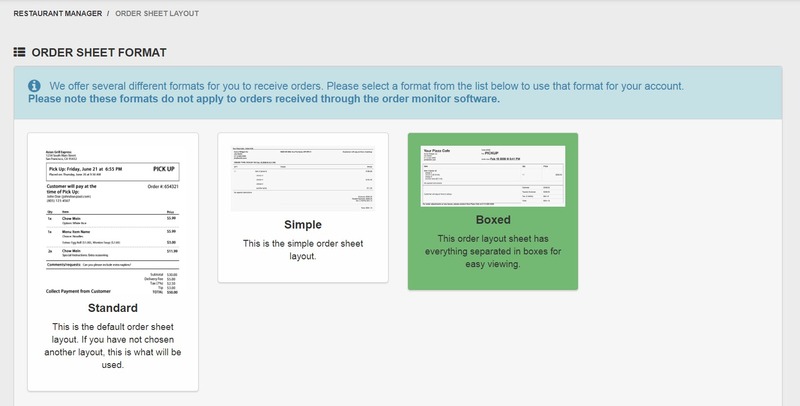 Here you will see your three options for order sheet layouts. From here you can also choose how you would like credit card info to be shown, the font size, a custom message for customers, a custom message for restaurant staff, a tear off recipient, and information about whether a customer is returning or new. The custom order sheet message is seen by the customer with each order sheet sent. This can be something like thanking them for their order, special instructions, advising customers about in store specials, or promoting a store special event. Remember to click Save Changes when you are done!